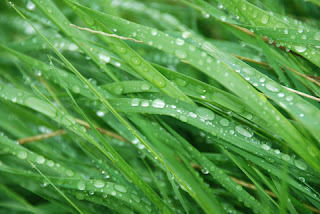 The relentless and widespread rain has caused many gardener's to ask: Should I mow my lawn when it's wet? In an ideal world it would be avoided. However, many people are just too busy to wait for the good weather. If the grass needs cutting, the weekend may be the only opportunity you get - even if it means mowing wet grass. With plenty of water around and the warmer temperatures of summer, the grass just keeps growing. The wetter it gets, the longer it grows. So is it OK to mow wet grass? With the correct equipment... yes it can be. Most lawnmowers will struggle. The leaves of the grass plant become heavier when wet and will clump together when cut. For most lawnmowers, especially those which collect, wet grass is just too much of a challenge. Many ride-on lawnmowers rely on air flow to collect grass clippings. This leaves them prone to clogging. The wet clippings block in the cutter and limit the effectiveness of the collector. Eventually, the cutter deck and discharge chute of the collector will jam up with the sticky grass clippings. Persist and you can even damage your lawnmower. At the very least, unsightly rolls or clumps of wet grass could be left on your lawn as the clippings clog up in the cutting deck and are ejected without being collected. It’s not just the poor finish on your lawn to worry about. Anyone who has mowed a wet lawn will testify to the mess caused by walking back into the house with wet clippings stuck to your shoes. If you use a pedestrian (push) lawnmower, make sure you raise the height of cut. The mower will be less prone to clogging if the clippings are shorter. Make sure you thoroughly wash the deck after each use. If you are looking to purchase a new mower, consider a cylinder or reel mower rather than a rotary. A cylinder mower won't clog. If your lawn is larger and you require a ride-on or garden tractor, consider the cut and collection system from Countax and Westwood. Their systems work in a totally different way to the air-flow method described above. A powered brush, driven by the tractor’s PTO (power take-off), sweeps the clippings from the lawn. The sweeper is effective in wet or dry conditions and, because of its design, out-performs almost every other type of collector on the market. The cutter blades in the deck cut the grass and then throw the clippings into the path of the grass collector.The powered grass collector, towed behind the tractor, sweeps the cuttings into a collector net. Almost nothing is left behind.